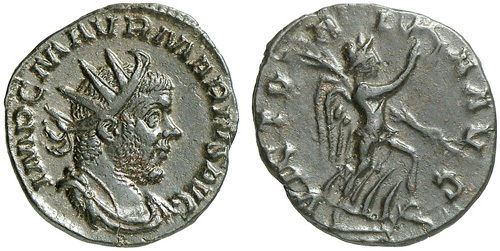 M. Aurelius Marius, was the fourth of the usurpers who in succession ruled Gaul, in defiance Gallienus. He reigned only two or three days, but there are coins of his extant. Obverse: IMP C M AVR MARIVS P F AVG, Radiate, draped, and cuirassed bust right. Reverse: CONCORD MILIT, Clasped hands. Obverse: IMP C MARIVS P F AVG, Radiate, draped, and cuirassed bust right. 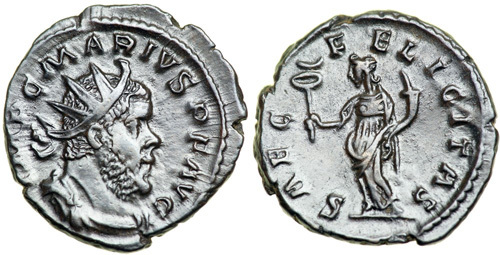 Reverse: SAEC FELICITAS, Felicitas standing facing, head left, holding caduceus and cornucopiae. Obverse: IMP C M AVR MARIVS AVG, Radiate, draped, and cuirassed bust right. 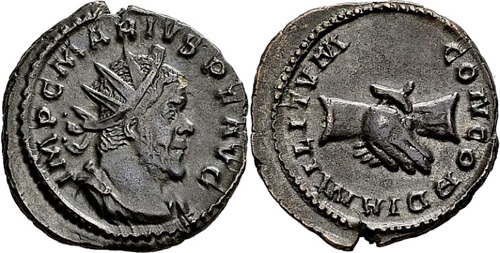 Reverse: VICTORIA AVG, Victory advancing left, holding palm in left hand and wreath in right hand. 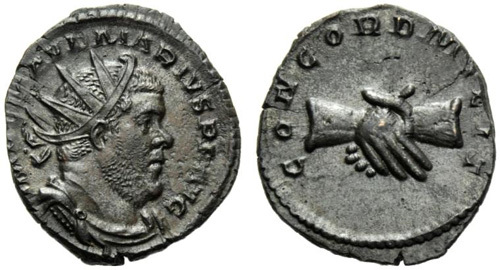 Reverse: VICTORIA AVG, Victory standing left, holding palm in left hand and wreath in right hand. 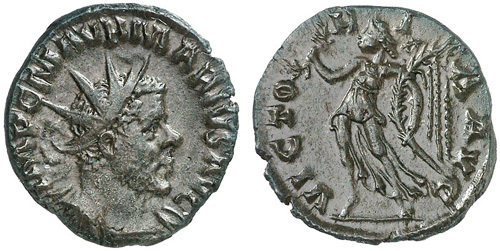 Reverse: VICTORIA AVG, Victory walking right, holding wreath and palm. Obverse: IMP C M AVR MARIVS AVG, Radiate and cuirassed bust right. 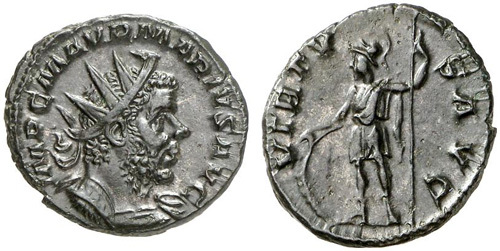 Reverse: VIRTVS AVG, Virtus standing left, holding spear and shield.